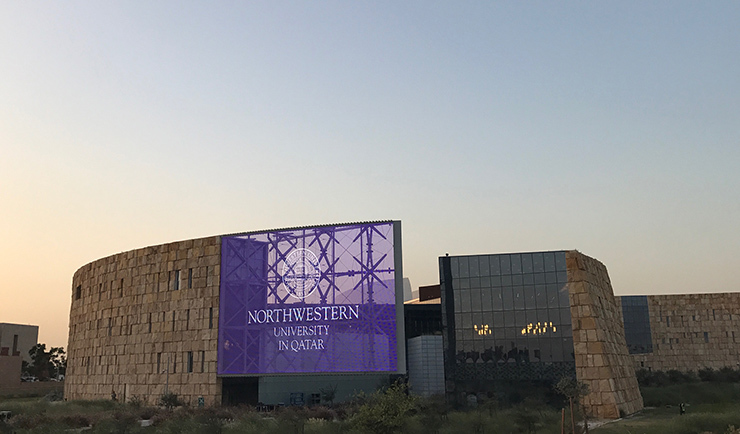 There’s an interesting interplay going on with Northwestern University in Qatar’s new building for its journalism and communication students. Outwardly, the building uses stone walls and the shape of two swords to fit into the desert landscape around it. But inside, the building has a three-story atrium and spaces set up for collaboration and innovation. The building, designed by famed New Mexico architect Antoine Predock, is a good metaphor for what’s been happening in Qatar for some time. It’s a country with a history of openness that includes people from the Taliban, an exiled Egyptian cleric and a U.S. Army base. But that’s also landed the country in hot water, as it’s now the subject of a trade and diplomatic embargo by five other Gulf States including Saudi Arabia. That has put the school in a tough spot, trying to be open to enrollment from all the Gulf states, but having to work out fall-back plans for three Bahraini students currently enrolled. "We see this [embargo against Qatar] as a challenge to freedom of expression, and it’s brought out Qatari leadership talking more forcefully about press freedom than ever before." I recently spoke to Dennis about what it’s like for the school to open a brand new building — so large and welcoming to the community — while the country was under a blockade that made getting milk and some food challenging. Below is a lightly edited transcript of our conversation, with a couple audio clips. So the big news for you is that you moved into a new building on your campus. Tell me about the new building and what it offers. Everette Dennis: We moved into an extraordinary communication center, it’s a very large building, 515,000 square feet, which is perhaps the biggest communication school in the world. It has the infrastructure of a television network and a Hollywood studio, so it has all the bells and whistles that you could imagine. It has a cinema with Dolby surround sound, a spectacular library, a robotic newsroom like nothing you’ll see anywhere else. We’re going to open a new museum called the Media Majlis, that will connect the history of the field of communication and media globally but with an Arab imprint, which will be interesting. The building also has a three-story high video wall that can be used for programming and classroom instruction. The exterior also has a large video wall called the “saif tip” as the building is shaped at the top like two Arab swords. It has two big limestone walls and the interior is all glass looking out. Our architect, Antoine Predock from New Mexico calls it an instrument to be played and we take it seriously not just as a new building to move in old ideas but to think creatively about what we teach, and what values we bring into the building. You said you didn’t want to bring in old ideas, so have you had to rethink programming as well to fit with the new structure? Dennis: We have, and we started a couple years ago with curriculum task forces looking at how we look at the world of modern journalism in the digital age, what the entertainment media looks like through narrative and documentary film and strategic communication. And it’s really analogous to moving into a new house. You could move into a house like most of us do carrying in the old furniture and rearranging them. Or you could move in with a fresh start. We tried to have a fresh start and brought virtually nothing with us except our physical selves and our teaching values. We’re also thinking about how we can connect our technology with the values we want to promote as well. We think it’s very important in a place like Qatar, where we are helping create a modern media force of folks who will the the present and future of media here. We’ve already had an impact in the country, and we’re getting more interest from other countries and even our U.S. student population has gone up. We hope it will inspire creativity among our faculty, our students and others. Your students also created a special series called “Building Doha” to show how architecture in the city has changed so much in just the last generation. How did that project go? Dennis: We have a wonderful faculty member named Christina Paschyn, who’s both a digital journalist and filmmaker, and she got that project going. When you sit in a place that’s flat and in the desert, which sits on the Gulf, you don’t have the mountains like you do in California to look at, so what do you look at? The architecture. And there’s the traditional architecture, and an extraordinary number of new spectacular buildings by world class architects, like Jean Nouvel and I.M. Pei and others. It’s a wonderful way to look at the city and not only to appreciate it, but also to be critical and look at the challenges beyond just the wonder of it. So the students write not only about the buildings but also about the effect on the people. That will go on to be a signature project of our school. A few years ago we did one called “Feeding Doha,” which was about food safety, and it resulted in websites and e-books and other kinds of output. With the push for digital technology, and online learning, why do physical buildings still matter so much at universities? Dennis: Well you could argue that they don’t, but they make a statement. In Qatar, one of the statements that Education City makes with its schools like Cornell, Carnegie-Mellon, Texas A&M and Georgetown, it’s a statement about the importance of the education in the country. And I think physical spaces are important for some kinds of face-to-face physical gatherings — people seem to want that. One could do everything digitally and online and not connect with the rest of the world, but we still think it’s important for people to interact in person while still appreciating all the power of the digital world. We always say about our building that maybe thousands will actually see the building [in person] but millions will benefit from the resources we have and the programs we can mount if we do it right. How has your campus and the students dealt with the recent conflict in the Gulf region, with Qatar being isolated by Saudi Arabia and other countries? Dennis: Yes, that came as something of a surprise when that happened on June 5 when these four nations and later a fifth said they were breaking diplomatic relations. And since that time it has raised some modest challenges like food shortages, there were blockages at the borders, but over the course of the summer, we’ve really operated as business as usual. At an institutional level, we have master plans for an emergency, all the way from modifying classes to changing times all the way to total evacuation, but we don’t think that will be necessary. For students, it’s put them in the maelstrom of global geopolitics and higher education. It’s a great learning experience to see what happens. It’s been fascinating intellectually and professionally to watch this and write about it and cover it, and also to be aware that the centerpiece of this dustup is a communication and information war between these countries. And some people feel there has been a smear campaign against Qatar that went on for a number of years. We see this also as a challenge to freedom of expression, and it’s brought out Qatari leadership talking more forcefully about press freedom than they ever have before, because there was a threat that Al Jazeera might close [it was one of the demands the other countries made to resume relations with Qatar]. We think that threat’s now reduced. It’s utterly fascinating, but we plan to open school in mid-August as we always do. We’ve heard about fake news and its importance in the last U.S. election, but it also seems to be playing a role in the Middle East as well. How do you plan to integrate that into your curriculum in the fall? Dennis: Well in one way it’s a fortuitous development because it’s in your face. In Qatar, much of the conflict was set off allegedly by a hacking attack to the Qatar news agency which made claims about the Emir of Qatar and things he had said. From the beginning, the Qataris said this was fake and not true, and even now it’s been proved in an article in the Washington Post that this was planted. It’s an example of fake news that had little basis in fact and was used to ignite this kind of diplomatic breach. It’s very serious… with people whose families are torn apart. It gives our students real-world exposure to something that’s important. And shows us why Doha is a great place to have a communications and journalism school because the news often comes right to our doorstep. Do you think there will be student reporting projects that come out of the conflict happening here in Qatar? Dennis: There will be, absolutely. Some of the things have been a bit bizarre. Milk usually comes from Saudi Arabia, but now milk is coming from Turkey, and someone is bringing in 4,000 cows. It’s creating a mini-agricultural sector — it won’t provide enough milk, but more food is coming. There will also be some economic effects and cost factors that will affect all of us in our daily lives. You usually do an annual report on media in the Middle East. How have things changed in the region over the past year? Dennis: Yes, this will be our fifth year of doing that report, but it will be coming out in September. We have recent data from these countries, from Bahrain, UAE, Jordan, Saudi Arabia and others — and we’ll be able to make comparisons about attitudes toward freedom of expression. For the most part, people in the Gulf states are very heavy users of social media. Countries get 90%-some penetration. Of course countries like Egypt that are poorer have less smartphones. Each year we see the rise and fall of certain social media — Facebook, Instagram, Twitter. We have now five years of data that tell us a lot. Even in the most repressive of societies we’ve been able to go in and do this extensive research. That aren’t that many projects like this that include 6,000 face-to-face interviews. Most things are done online with less controls and precision. The future of this region of the world will be seen in social media, and the impact those messages have on governments and consumer activity and people’s attitudes is really important. You also have a new Middle East Studies minor. How does that fit with the communications and journalism degrees you offer? Dennis: It’s serendipitous, really. We never set out to have a Middle Eastern Studies minor, but so many of our faculty came with extraordinary backgrounds. One of them, Khaled Al-Hroub, came to us from the University of Cambridge, where he was head of Arab media studies. We also have an anthropologist and sociologist, and we realized that we have a considerable set of assets when it comes to understanding the region. Our students in communications and journalism can do a specialization in this area and it really helps them with the reporting projects, and gives them an appreciation for local issues and events. We had students making a film on suicide bombers, and another on the problem of immigrant workers. It was something that students love because they can add it to their degree. Mark Glaser is publisher and founder of MediaShift. He is an award-winning writer and accidental entrepreneur, who has taken MediaShift from a one-person blog to a growing media company with events such as private roundtables between platforms + publishers, and weekend hackathons; the weekly MediaShift Podcast; and digital trainings, DigitalEd, in partnership with top journalism schools. You can follow him on Twitter @mediatwit.